There’s something brand new and innovative cooking in the BetSoft studio and they promise a hot winter 2019 with its upcoming title called Fruit Bat Crazy. In terms of the gameplay, this will be an interesting and challenging game. Actually, the exclusive Liquid Cascades will make all wins and explode one at a time, making room for the additional symbols to cascade. This is the fastest way for the Fruit Bat Crazy Big Win. Each time you form a winning combination and fill the Fruit Bat Trail up with special symbols, the Power Wins bank will be increased. After that moment, watch for the explosion of coins as matching icons will be multiplied according to the number of active paylines. 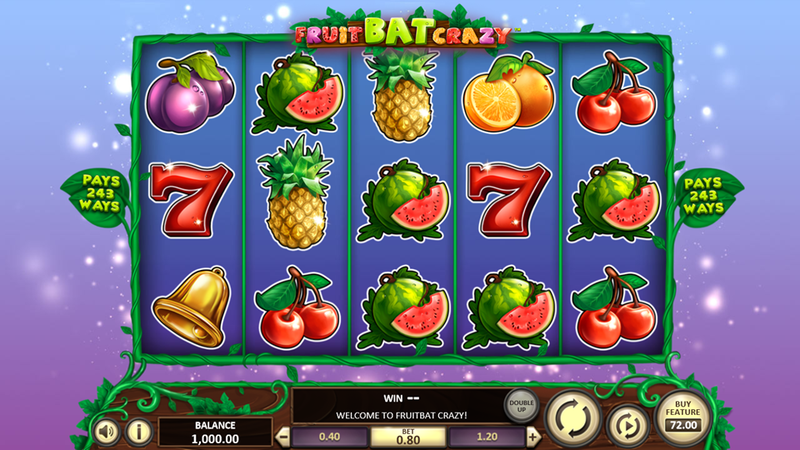 Within a few days, our Fruit Bat Crazy slot review will be updated with the official info about the RTP, winning tips and coin denomination. Until that moment, stay here and try one of the rewarding games presented on our dedicated pages. Unfortunatly, we have no free play mode for Fruit Bat Crazy available. Check out the screenshots below and hop right into action with one of the recommended casino sites!